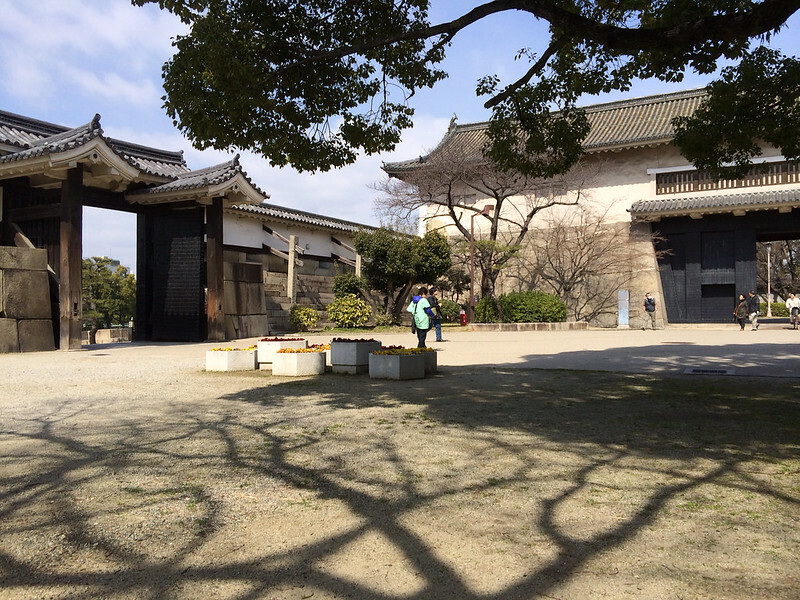 The Otemon Gate is located at the front entrance of Osaka Castle. 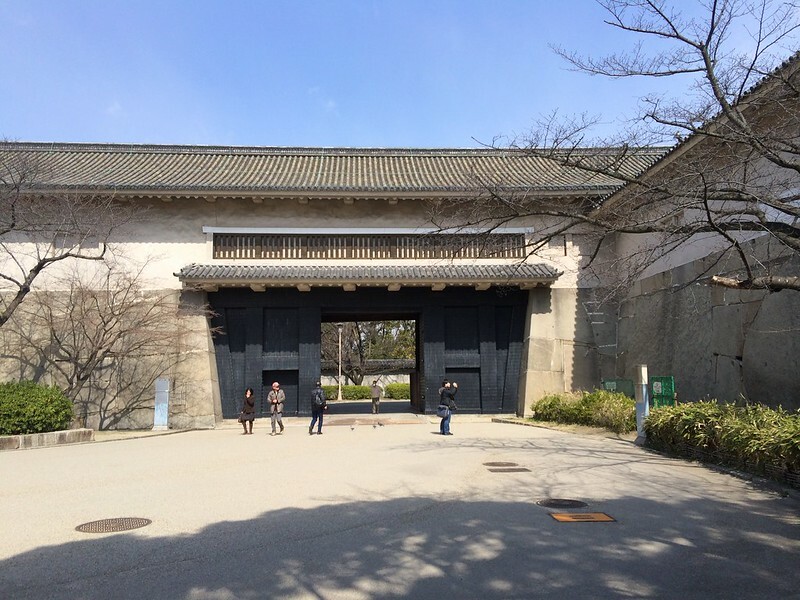 The gate was built during the early Edo period in 1628, in Koraimon style with a large roof laid atop the front two pillars and smaller roofs supported by the front and rear pillars on both sides. 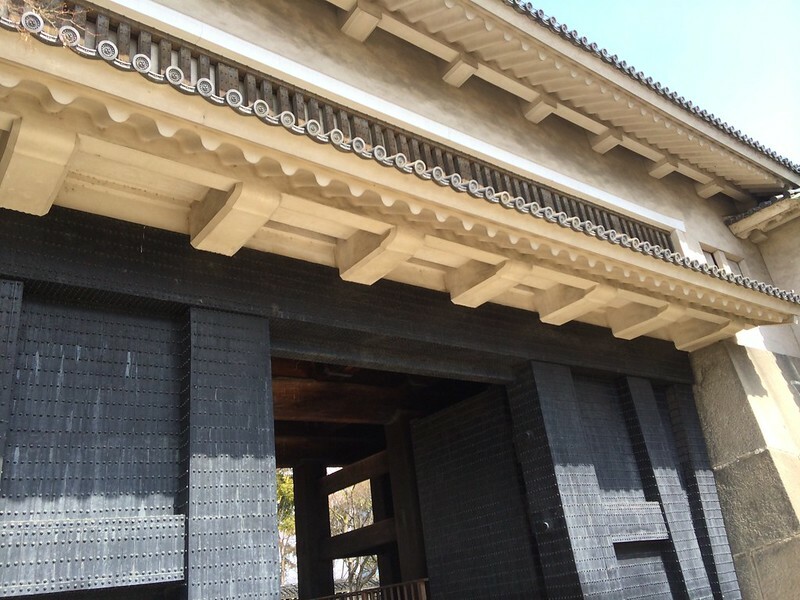 The bottom part of the pillars was repaired and reinforced by the traditional technique of removing the damaged areas and filling the cavities by joining new pieces of wood. Especially, the joint on the rear pillar on the observers' right side is so elaborate that it seems impossible at first glance. 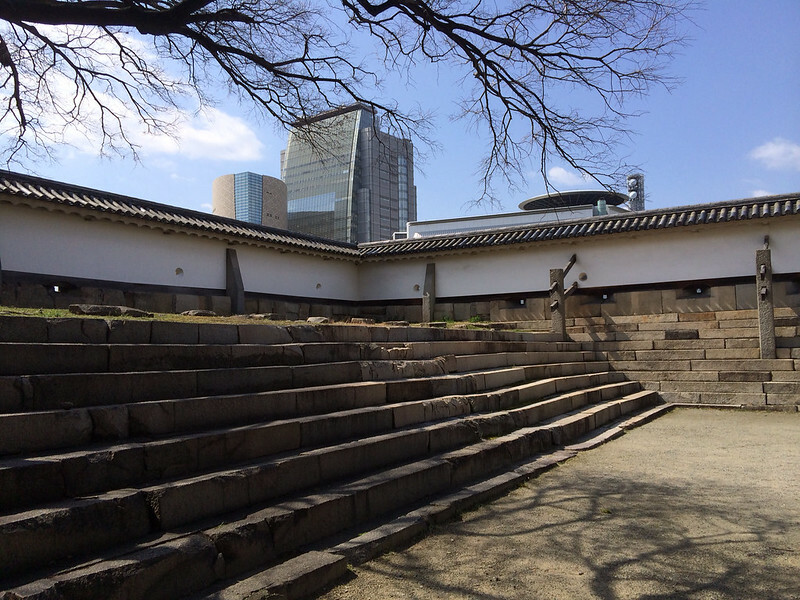 The Tamon-yagura Turret stands atop Ote-guchi-masugata Square's stone walls. 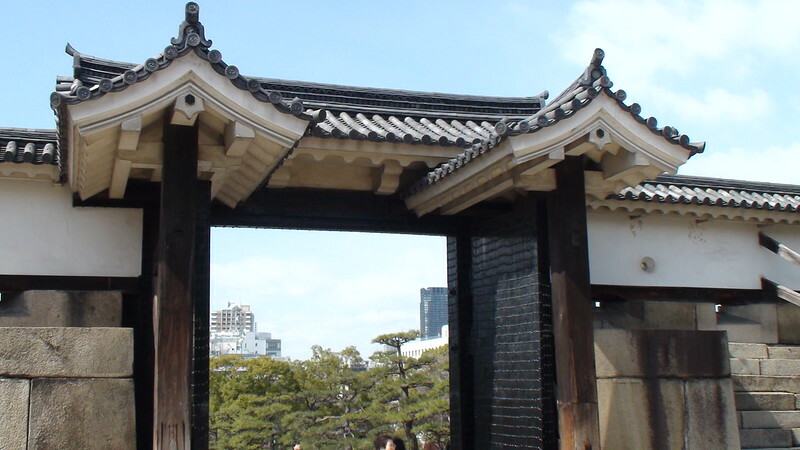 The turret was originally constructed during the early Edo period in 1628, lost in fire in 1783, and reconstructed in 1848. 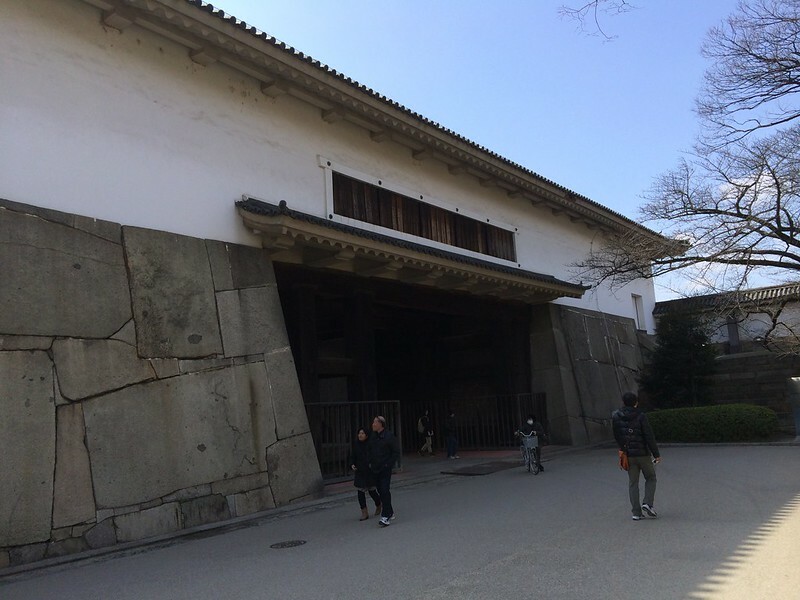 In general, the Tamon-yagura refers to a long turret built on an earth mound or a stone wall, and the name "Tamon" is said to come from the Tamon Castle where this style of turret was first constructed. 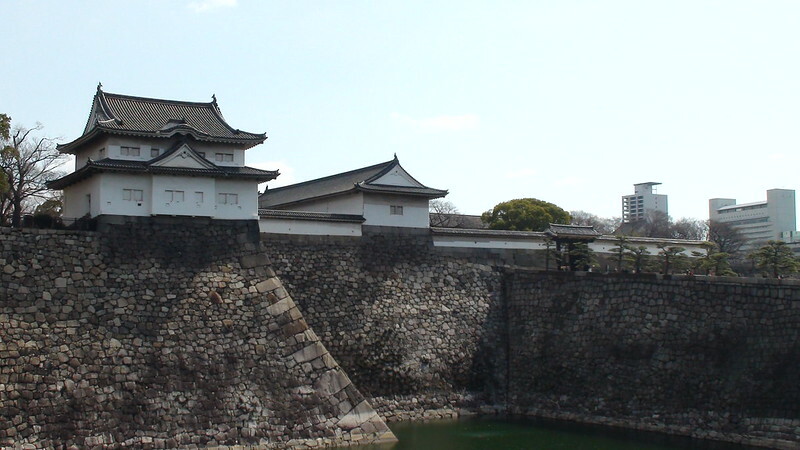 This specific Tamon-yagura Turret had spacious rooms, many windows, and outstanding defensive capability -- it was equipped with a device to drop spears right onto any enemies invading the castle through the gate just below the turret. 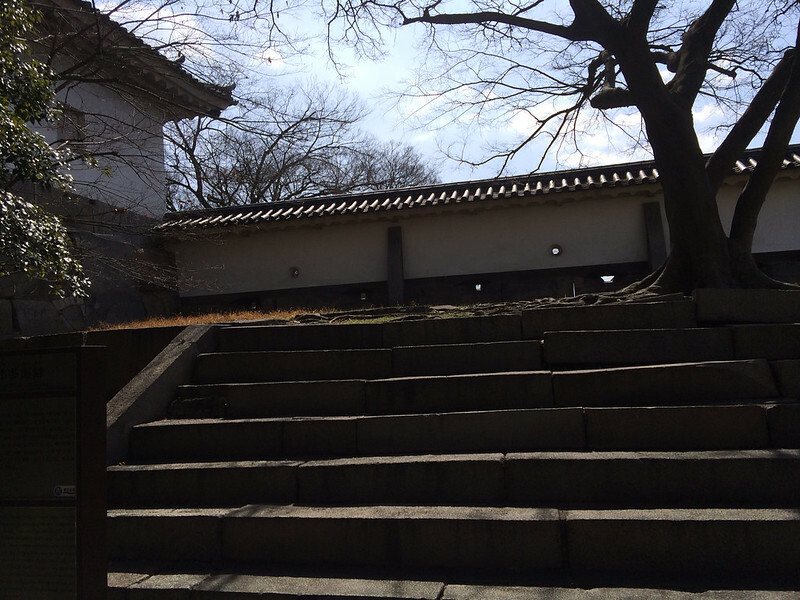 In the Edo period, there stood two Tamon-yagura Turret above Ote-guchi Entrance. While one of the turrets still exists today, the other, independent turret on the south side was lost. This turret maasured about 27m east-west and 6m south-north. 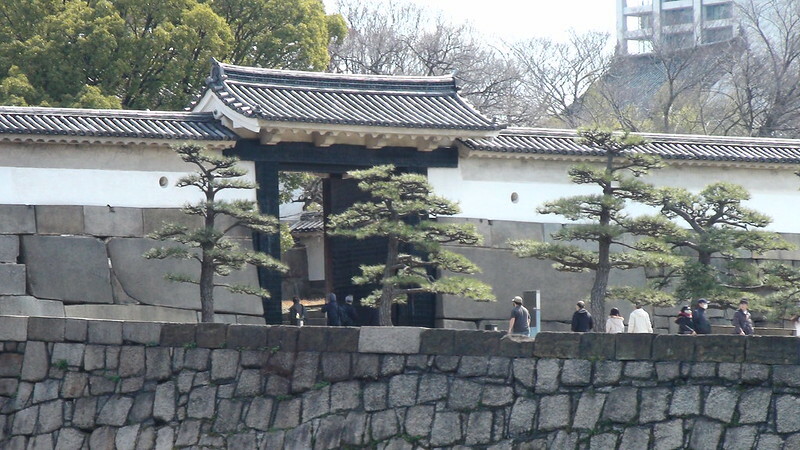 Merchants were allowed to enter the Ote-guchi Entrance on a regular basis, where a market was held for hatamoto, direct retainers of the shogun, who were assigned to one-year service at Osaka Castle by turns, to purchase daily commodities. 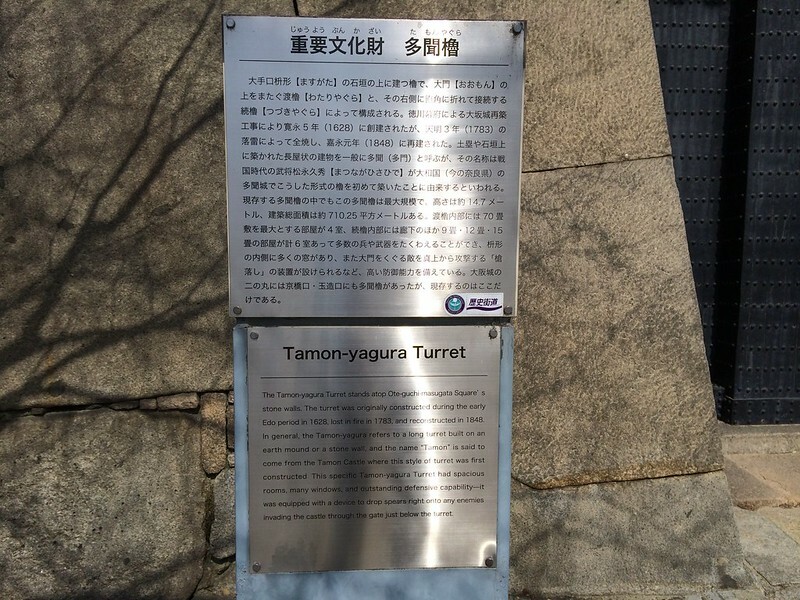 For this reason, the turret was called Ichi-tamon. "Ichi" means market. 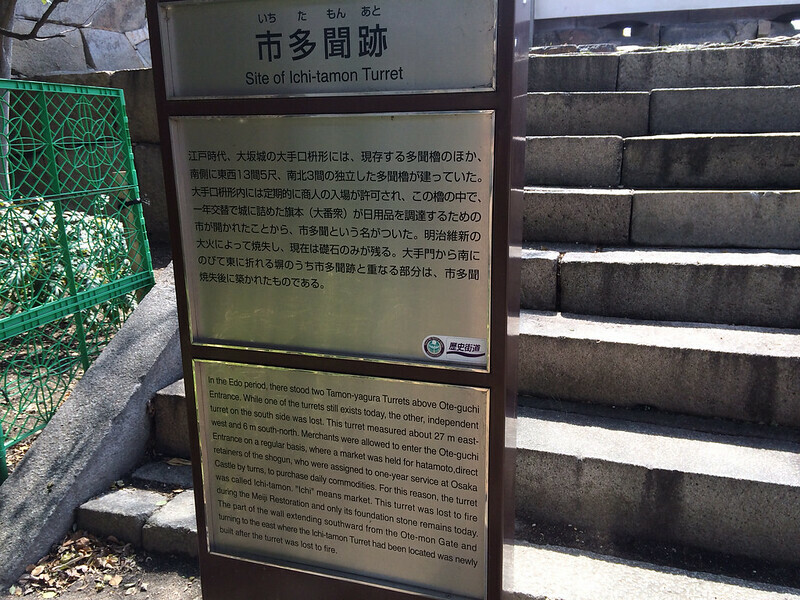 This turret was lost to fire during the Meiji Restoration and only its foundation stone remains today. 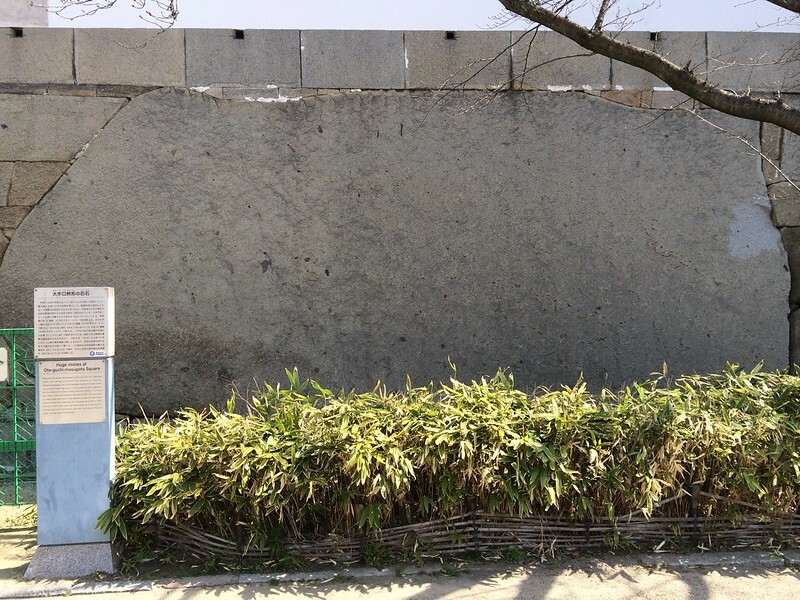 The part of the wall extending southward from the Ote-mon Gate and turning to the east where the Ichi-tamon Turret had been located was newly built after the turret was lost to fire. 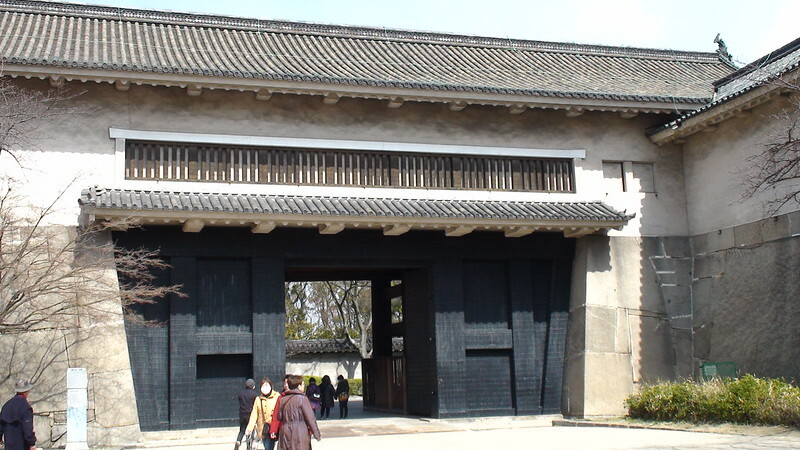 Masugata is a square set adjacent to the main gate of a Japanese castle and served to prevent the intrusion of enemies. 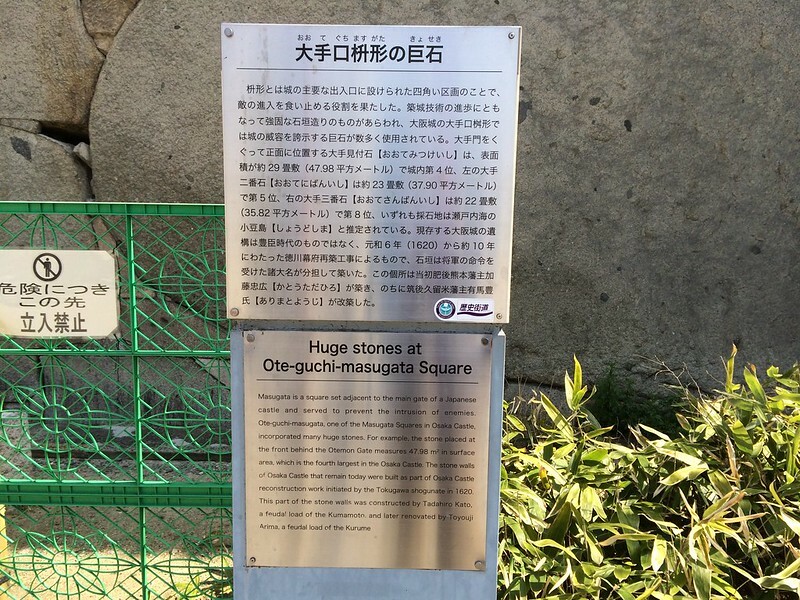 Ote-guchi-masugata, one of the Masugata Squares in Osaka Castle, incorporated many huge stones. 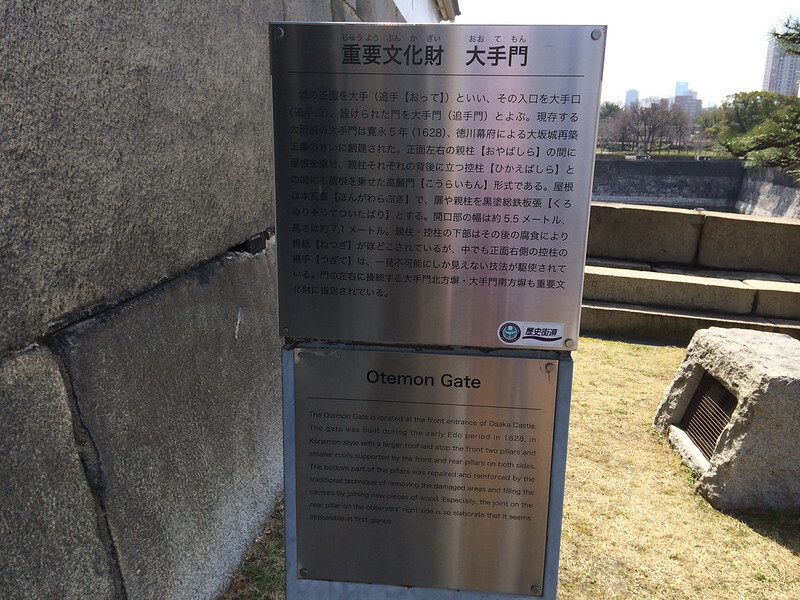 For example, the stone placed at the front behind the Otemon Gate measures 47.98 m2 in surface area, which is the fourth largest in the Osaka Castle. 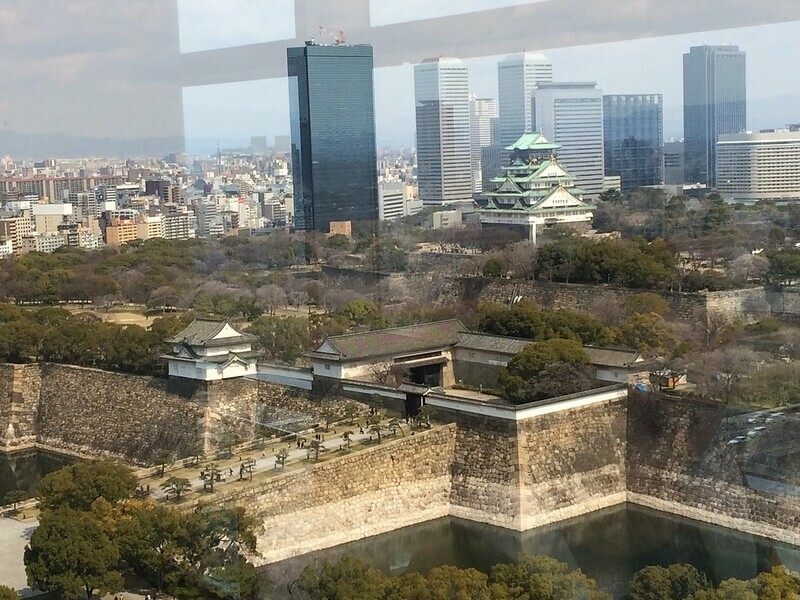 The stone walls of Osaka Castle that remain today were built as part of Osaka Castle reconstruction work initiated by the Tokugawa shogunate in 1620. 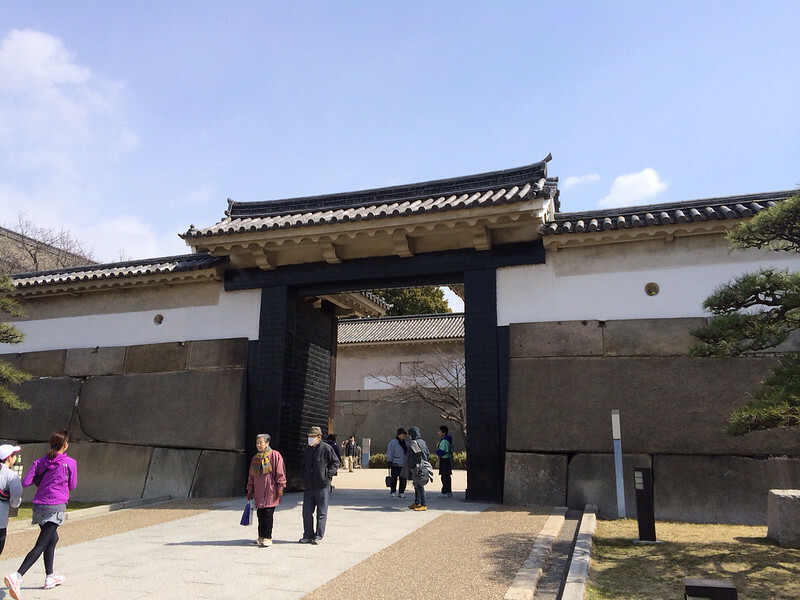 This part of the stone walls was constructed by Tadahiro Kato, a feudal load of the Kumamoto, and later renovated by Toyouji Arima, a feudal load of the Kurume.